Episode 57 coming at ya. 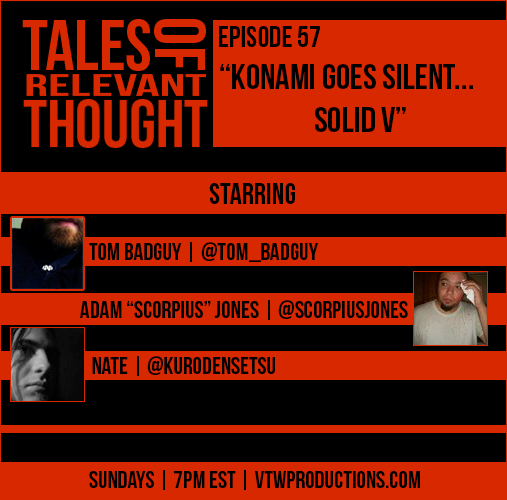 Adam Scropius Jones joins in as we discuss everything going on with Konami and silencing of Hideo Kojima. This brings on the biggest question, which is, what is the future of Snatcher? We also cover somethings we missed, like the Charlie game play trailed for Street Fighter V that came out over a month ago, as well as Marvel and Sony working together to bring Spider-Man back to the creative hands of Marvel. So much more, so take a seat and let us sooth your ear pussies with our newest ep!